The boys are stranded on a strange alien world, and do their best to try and figure a way off of it. Rex Luthor finds them, but is taken down by Tommy Tomorrow. Tommy captures them all, and takes them to Takron Galtos - The prison planet. Story - 4: It is no secret that I love this book, and its characters, I do feel that it may be stagnating a little. We have been in a space adventure since the first issue, but now that we have come to the half way mark, we seem to have lost a little momentum. The book is still very much a fun to read, but this story with The Gang feels like it has been going on a little too long. However the good outweighs the bad, as the character moments are great. The boys still have a great friendship, with the snarky quips and the sarcastic synonyms. "Robin... Would you please stop hunting the fruit!" Its lines like this that reminds you that you can have a lot of fun with these characters when they are written well. Hence why I love what Tomasi has done with both Damien and Jon. He certainly has nurtured these two, into who they have become over the last few years. Rex Luthor makes yet another speech about his future plans, only to be thwarted by Tommy Tomorrow. 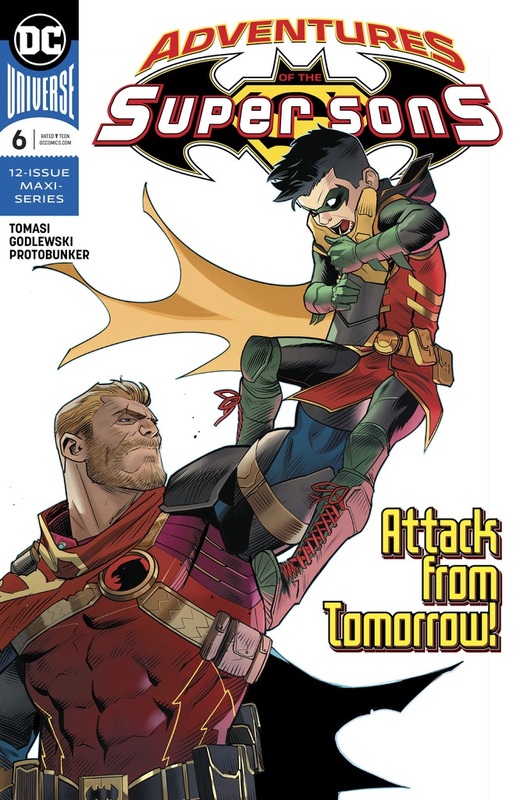 Tomasi has proven that he can use some of the forgotten and obscure characters in the DCU to great effect, and this issue proves that with the use of Tommy Tomorrow. As I said before, this is book is very much a Silver-Age title, written in today's continuity, and it is very enjoyable, so here's hoping that Tomasi can pick up the pace for the story again soon. Art - 4: Scott Godlewski did the honors of handling the art duties for this issue, and he did a great job of it. He managed to capture as much of the style that Barberi brings to the book, whilst still keeping his own unique look. I loved the way he drew Robin crouched on the tree branch on the first page, and his take on Tommy Tomorrow looked really awesome and well detailed. Sadly Jon's face looked a little off at times, and in some panels the faces of some other characters looked really stiff, but other than that, Godlewski managed to do a fantastic job capturing the same energy that Barberi brings to the book. Protobunker's colors are as exceptional as usual, they really tied together the tone of the book, even with the art change for just this issue. Cover Art - 5: I really like this cover by Dan Mora. The negative space in the background really works, as it draws the focus to the two main players. Though it does give away the surprise reveal of Tommy Tomorrow.